Between 1810 and 1813 Rossini wrote five short comic operas for the San Moisè theatre in Venice. The last and best of them is Il Signor Bruschino, which also turned out to be the least successful of the five, and not for lack of all the trademark virtues that make Rossini’s comic operas inspired gems. The musicians contentiously boycotted the premiere, annoyed that they were expected to tap their music stands with their bows in the now famous overture. And to top the tapping troublesomeness, the mean-spirited music critic for one of the local papers wrong-headedly panned the work. That year Rossini bid Venice and the venetians ciao amici, left for greener pastures at the bottom of the Italian boot, and never looked back. Il Signor Bruschino has a libretto by Giuseppe Foppa who appropriated— before the days of author’s rights—the plot of Le fils par hazard, a French farce of dubious provenance. Foppa and Rossini spruced things up and created a delightful confection with eight characters firmly rooted in the popular Italian commedia of Gozzi and Goldoni. The story is as comically complex as it gets: a boy-loves-girl-loves-boy concoction, of romance initially thwarted and ultimately blessed by two recalcitrant father figures. If Bruschino is not vintage Rossini, it is still a fine table wine from a very good year. 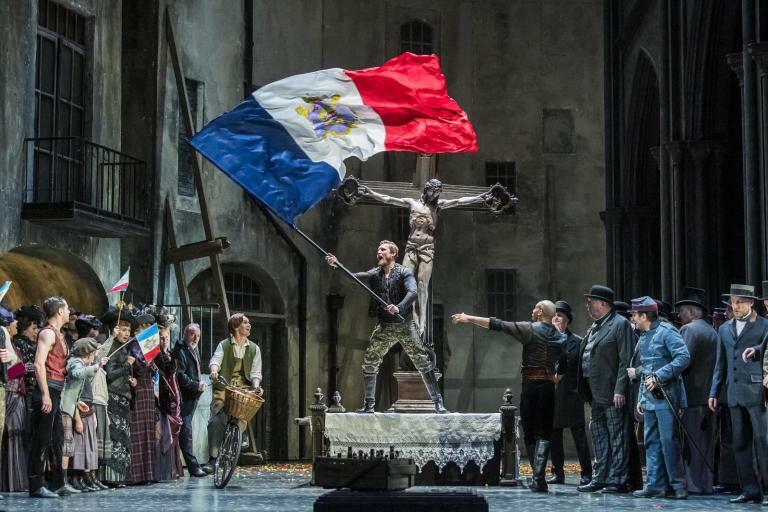 As Filiberto, Gaudenzio and Bruschino, Sr. (three buffo baritones), Joseph Mazzara, Eric Shane Heatley and John Tibbetts magnificently helm the outrageous proceedings, aided by the traditional tenor-soprano pair of lovers, Sofia and Florville. There’s the busybody maid, played to the hilt by Paulina Villareal, and the real Bruschino (the hilarious Thomas J. Capobianco doubling as a commissario with an addiction for sweets) whose arrival at the very end sets the musical wheels of the finale in motion. Rossini’s florid arias, duets, and ensembles keep the superb cast of eight busy, and all prove themselves to be assured comedians. Florville’s Deh! tu m’assisti amore, and the duet Quanto e dolce a un’alma amante for him and Sofia are lyrical gems, as is Sofia’s Ah donate il caro sposo, with oboe obbligato gorgeously played by Jonathan Snyder. As the central pair of lovers, Erica Intilangelo and Benjamin Lee were beyond reproach. Lee is a tenore di grazia with effortless high notes and flawless fioriture, and Intilangelo is a superb singing actress who is good to look at and even better to listen to; she stopped the show with her aria di bravura. Rossini generously rewarded his low-voiced male singers, and the singers here take full advantage. The ensembles in which all three baritones wax about the hurdles and the glories of love are showpieces. Praise should go to Frances Rabalais, the stage director who astutely and stylishly kept the comedy buoyant, and the singing actors unfettered and on track. Conductor Avishai Shalom led the very good chamber ensemble of ten and also played the recitatives on the harpsichord with perfect pacing and a superb feel for the Rossini vocal line. The visual aspects of the production were ideal for the period: along with Dean Mogle’s costumes, Kelly Yurko and Danae R. Jimenez’ wigs and make-up design created characters dripping with the Empire fashion of Rossini’s youth, and designer Erik McCandless bathed Kristen Budke’s pretty two-tiered set in Italian sunlight. Il Signor Bruschino is a work of budding genius by a 21-year old composer on the rise who cryptically wrote “God save your soul!” on the last page of his overture, and forty-five years later, on the occasion of his 66th birthday again appended to the last page of his piano-vocal score these words: “I declare myself to be happy to have written this youthful sin.” Needless to say, his sin is forgiven and I hope Rossini is looking down from Parnassus and smiling at this sunny production.